We all get sidetracked from time to time. Either through the power of eye-catching advertising or a promo email from your favorite retailer. 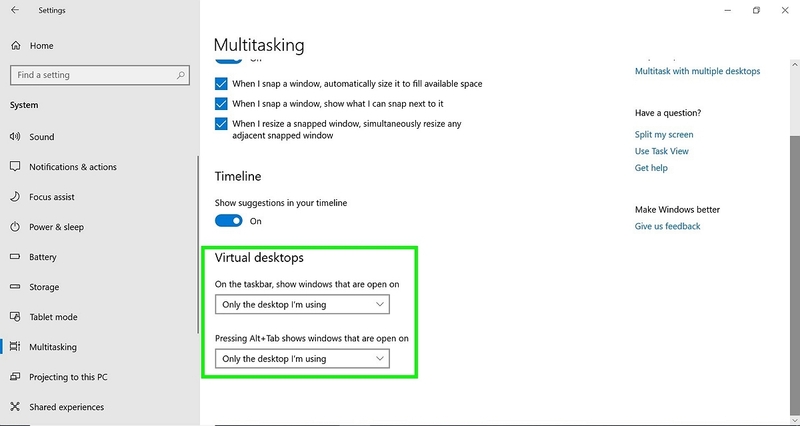 Using virtual desktop in Windows 10 allows you to expand your desktop beyond the physical limitations of the space, organize groups of related tasks, and easily switch between them. Tackling what you want to—when you want to—just got a whole lot easier. 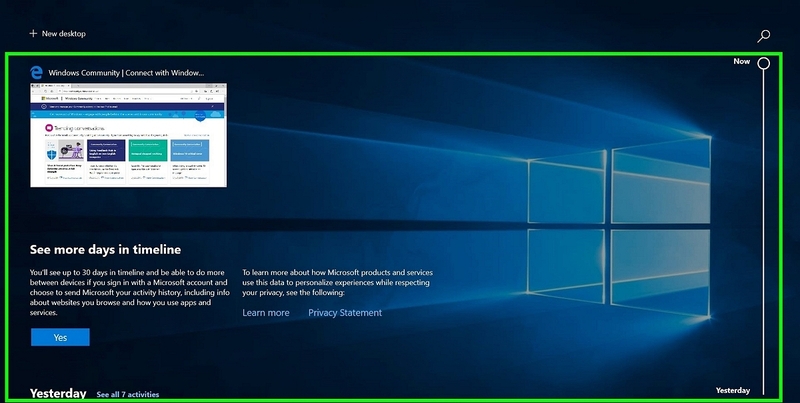 Where to find virtual desktop in Windows 10? Select the Task View (formerly known as Timeline View) icon directly to the right of the Windows Search box. + New desktop will appear in the upper left-hand corner of your screen. Under + New desktop you’ll see all your open applications or windows as well as your Timeline (a history of your recently opened projects). Each virtual desktop you create allows you to open different programs. Windows 10 allows you to create an unlimited number of desktops so you can keep track of each one in detail. Each time you create a new desktop, you’ll see a thumbnail of it at the top of your screen in Task View. Select any of your virtual desktops to open it, or skip between desktops by using the keyboard shortcuts, which we’ll discuss later in this article. Select Task View on your taskbar then + New desktop icon in the upper left-hand corner of the screen to initiate a new desktop. See which applications and pages it has open along with its timeline by hovering over it. Use the X at the top of each virtual desktop to delete it when you’re done using it. Any applications that you had open on a virtual desktop that you delete will automatically be moved to your main desktop. To avoid this, make sure to close any open applications associated with a virtual desktop before closing out of the virtual desktop itself. 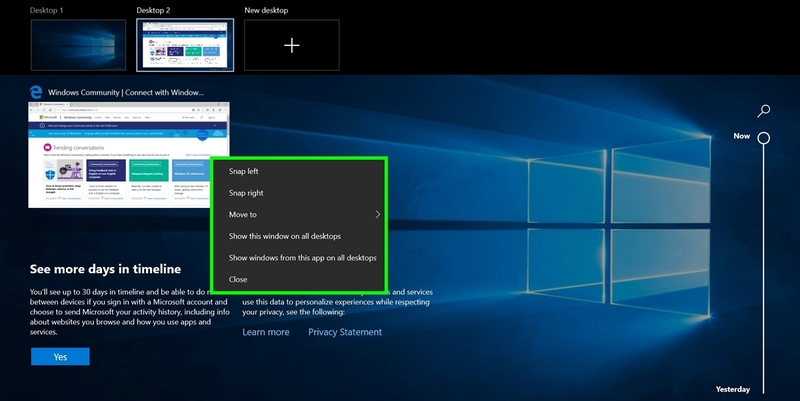 Right-click on any open window to manage the view of your virtual desktop. Use the snap options to affix a desktop to the right- or left-hand side of your screen. Alt + Tab: shows all the current applications opened individually. Clicking Tab while holding Alt allows you to move between them. Windows key + Ctrl + Left or Windows key + Ctrl + Right allows you to move quickly between multiple desktops. Windows key + Ctrl + D then click + New desktop: to create a new virtual desktop without using the Task View. Windows key + Tab: allows you to return to Task View. There are two general settings for virtual desktop in Windows. Press Windows key + I to open Settings. Go to Systems, select Multitasking, then scroll down to Virtual desktops. Both are automatically defaulted to Only the desktop I’m using but, depending on your preference, you can set each to show on all desktops. That’s it! Cut down on wasted time and focus like a laser beam when you divide and conquer using virtual desktop on Windows 10.